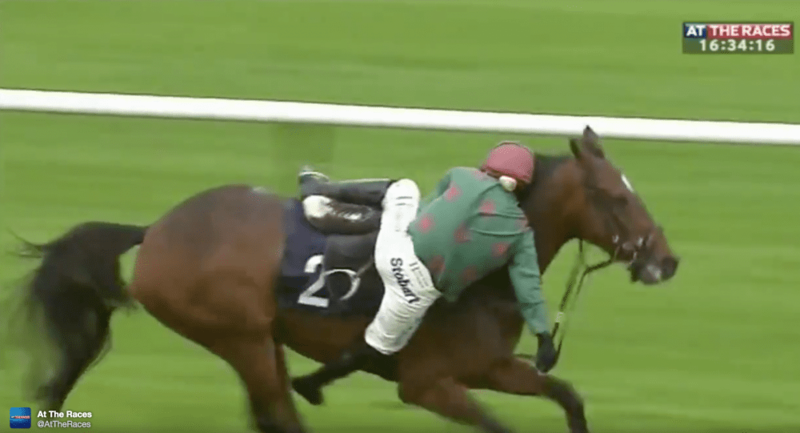 It was a rough day at the office for British jockey Bridget Andrews. With victory all but assured in a jumps race at Southwell Tuesday, Andrews popped out of an iron less than 20 yards from the wire, lost her balance and fell off the would-be winner, 7-4 favorite Stick To The Plan. The horse was declared a non-runner and the 9-1 second-place finisher Nemean Lion was bumped to first. When Andrews and her mount cleared the final hurdle okay, her foot briefly came out of the iron but she regained it. Then strides before the finish, her foot came out of the right iron again and she tumbled from the horse. Andrews was not physically injured but was clearly embarrassed over the incident. So sorry to everyone I let down today! No excuses I fell off and I will make sure it doesn't happen again! Bettors weren't in a forgiving mood, particularly those who bet the horse during the race on exchange wagering platforms. However, Irish bookmaker Paddy Power gave some solace to angry punters. We are paying out on 'Stick To The Plan' as a winner in the 4.20 at Southwell after the rider was unseated when in the lead near the line! This entry was posted in NL List, People and tagged Bridget Andrews, British Horse Racing, British racing, exchange wagering, Jockeys by Scott Jagow. Bookmark the permalink.